Hello everyone. 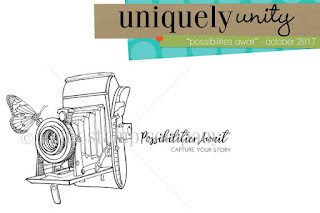 Donna K here with you today sharing another project using this month's Uniquely Unity Collection kit. The vintage camera stole my heart. I was going for a sepia effect using vintage photo distress ink and similar colors in Copic Marker to get the sepia feel. 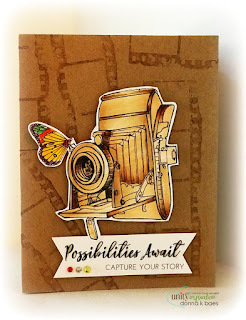 For the background of my card I used last month's SMAK kit called Truest Life .....the filmstrip was perfect. I can imagine so many ways to use this gorgeous kit. Cards, layouts, mixed media... definitely lots of possibilities. Please do share your creations with us on the Unity Show and Tell Page on FB. We love seeing what you are all up to. Have a day full of happy!